When spring has officially arrived and ushering in the new season, bold and bright orange hue has already started ruling the spring of 2018. Orange is the hue of joy, warmth, sunshine and happiness. No doubt this vibrant colour brings essence of enthusiasm in us. 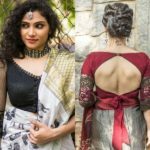 Here are some chic contrast blouse ideas that you can pair with your orange hued saree this sweet spring season. A perfect hue blouse can make or ruin your whole look. This orange saree with paired with right burnt yellow orange blouse takes the look to next level. We believe that if you pair tint and shade of same colour you can never go wrong. That contrast border on the sleeves adds an extra charm to the blouse. All you need to do is pull out your golden flats and black metal jhumkas and you are on board. You can keep your mane neatly tided or even a sleek ponytail will also compliment the look. This is a perfect ensemble for a casual outing or a get together. Cut work has the ability to add an extra grace to any garment and when it is on blouse it does wonder. 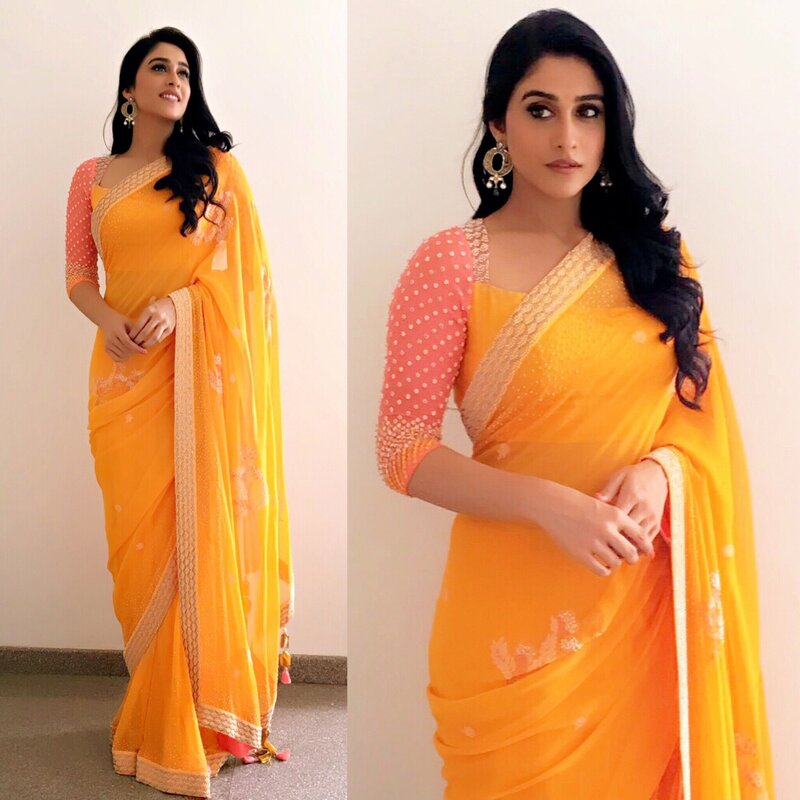 This orange saree with thin golden border is perfect attire for a wedding, which can be sported with a stylish, cut-work golden hand stitched blouse which will complement the whole look. 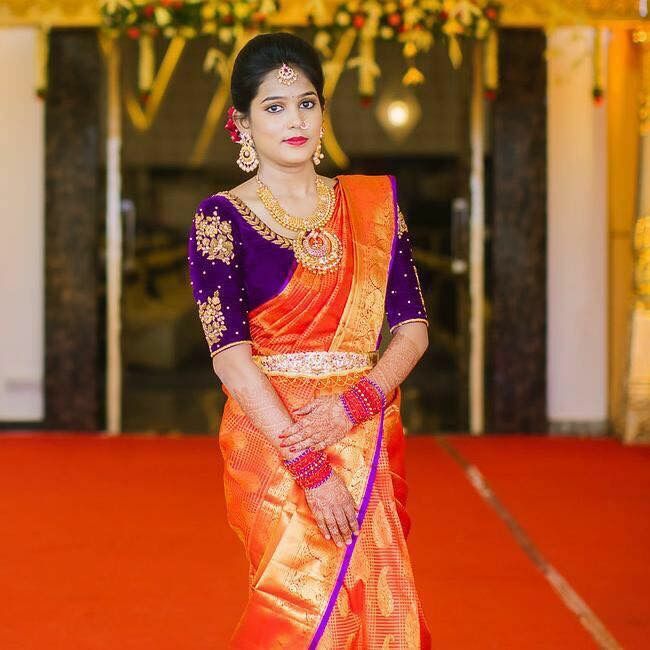 You can simply wear Kolhapuri chapel and jhumkas to add a traditional element to it if you are planning to wear it for wedding or can keep it simple when going for a family party. As black and orange always complement each other, so you can wear your black bangles in one and a wrist watch in other. This marvelous combination of orange georgette saree that is simple chic and a trendy pink blouse is perfect for a family get together. Along with the colour the prime beauty of the blouse lies in that beautiful zari motif. If you are willing to look attractive then this is one of the best styling partner for you that will assist you to look special and gorgeous almost anywhere you go. You can add those huge golden danglers if you are wearing it with a basic blouse. This look is perfect for a summer wedding because of this happy bright colour combination. Isn’t this perfect look for a proper south Indian wedding? Let yourself shine bright on the most special day of your loved once. This yellow blouse with golden paisley motif on it goes perfectly with this orange saree. You can add a hint of shimmer by wearing your chunky golden shimmer heels. That temple jewellery worn with “gajara” makes it perfect for this spring wedding season. This combination manages to look elegant and graceful. Even the purple border is also an eye catcher. You can easily wear it with simple flats or even mojarris will also do. Orange is the colour of happiness and warmth. 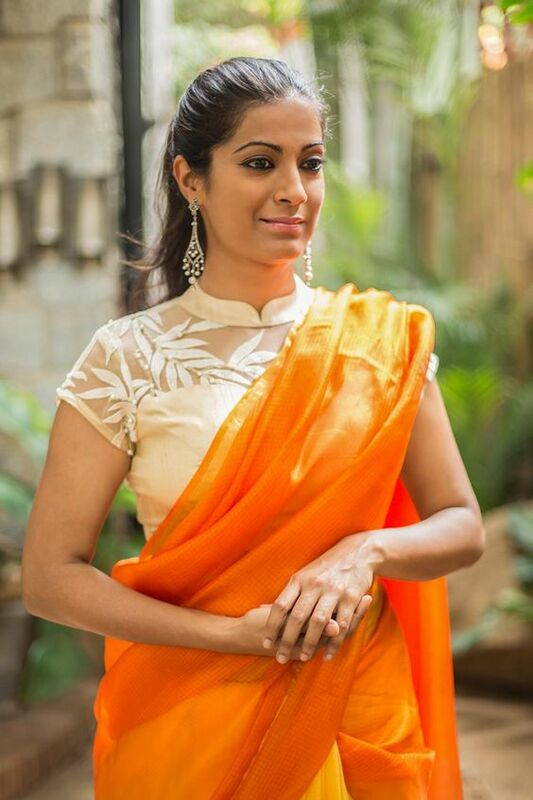 This cantaloupe hue blouse is another great combination with this bold orange saree. When you are just bored of those common contrast blouses here comes the unexpected once. This cantaloupe hue blouse has a white bead work over it, which adds all the drama in it. You can wear your mojarris along with those traditional menakari jhumkas keeping the makeup light and graceful. This is a classic one. A fresh green colour blouse when sported with a fire orange saree makes a perfect classy combination. Along with the blouse, the border also maintains to grab viewer’s eye. You can wear this for a formal party or even for a reception. You can keep the look very simple yet cool by adding a statement necklace to it. This stunning unusual Kalamkari blouse is for someone who likes to be creative and experimental. 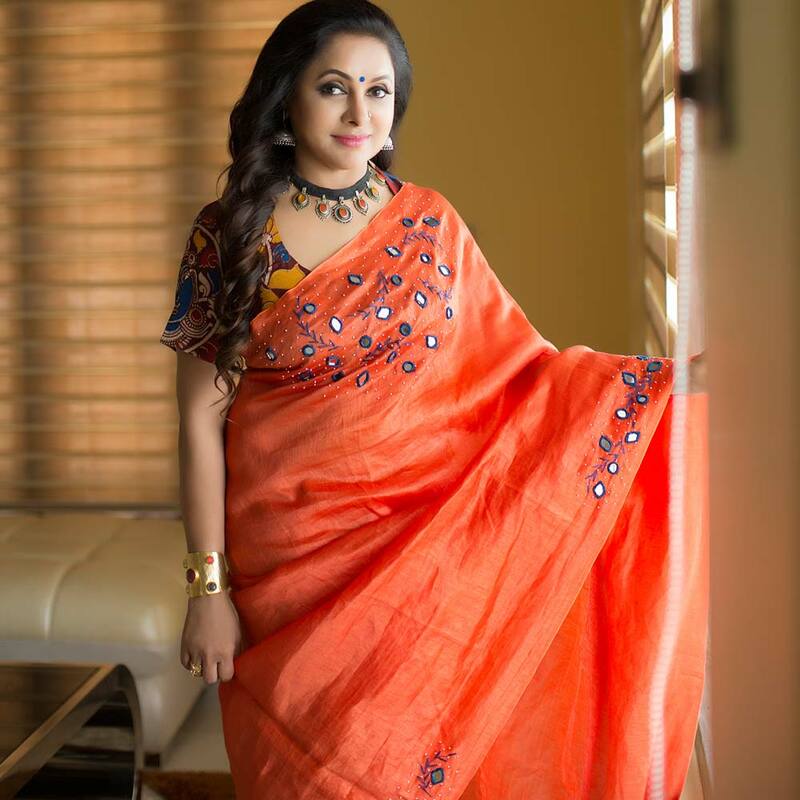 When paired with bright tangerine orange mirror worked saree like this, is make it an absolute knocker for women who love to experiment with different textures and style. Try a light makeup and classy hairdo with this lovely blouse. You will love the ever feminine sweetheart neckline with this flattering orange saree. You can add a basic wrist watch or a hand cuff keeping it simple yet smart. Embroidery is a delicate piece of work which brings out the beauty of an ethnic wear. This violet blouse with golden embroidery on sleeves is perfect attire for a wedding when sported with a beautiful orange silk saree. Orange is flattering for all skin tones and the deep rich tones of violet give it just the right amount of contrast to ensure it’s not too striking. Try this look and just a break it up a little with some gold accessories. There are some colour combinations with which you can never go wrong one such combination is – cobalt blue and orange. This cobalt blue embroidered blouse looks perfect when paired with this deep orange saree with golden zari border. You can wear statement kundan jhumkas to keep the look simple yet admirable. You can opt for this look when going for a function or for a ring cermony. There is one fashion mantra that is never overdo your style. 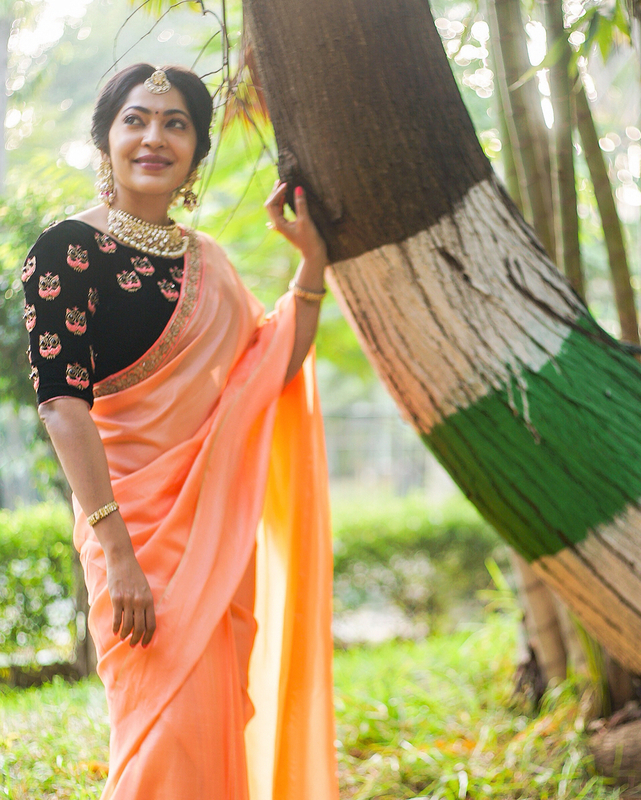 This black blouse with orange saree is very common but when paired with dramatic jewellery like this, it makes the style more interesting. When you are opting for a very basic contrast combination then make sure your jewellery is outstanding once. You can wear this for a casual day out or for a brunch. We generally go for those outdated color combination and we often don’t opt for something unique. Try this unusual combination of cream net blouse with this marigold yellow saree which is smart and chic. This cream hue blouse with mandarin collar is perfect for a formal party or a day wedding. As you see, orange saree can be elevated to whole new level when paired with various contrasting hue blouse of your choice. Keep experimenting with these blouse colors and you will thank us for the dramatic look your orange saree comes up with.